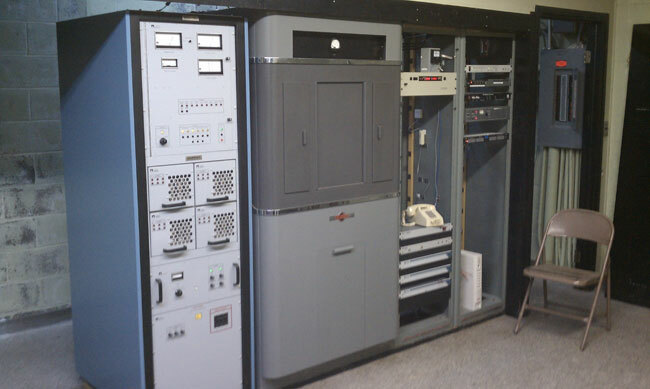 Received a call last night, after a particularly bad thunderstorm, that WGHQ in Kingston, NY was off the air. Earlier in the day, the transmitter had tripped the main breaker after a thunderstorm. I arrived at the transmitter site and found the breaker tripped again. Once the breaker was reset, the transmitter came back on and ran without any overload indications. The transmitter is a 10 year old Nautel ND-5. I was thinking breaker fatigue as the breaker is the original 1960 breaker installed when the building was built. I reset the breaker and turned the power output down to 3 KW, thinking the reduced load might not trip the breaker until we could get a replacement. The transmitter was on the air running as I was about to lock up and go home when I heard, but more felt through the floor, a THUMP! There I stood and watched the transmitter go dark. The B- voltage was right where it should be at 72 volts. The service panel breaker, which was tripping, is rated for 70 amps, the transmitter front panel breaker which did not trip, is 50 amps. The Nautel factory rep was thinking either breaker fatigue or the big transformer in the base of the transmitter had gone bad. According to him, no one had ever heard of a transformer going bad in these transmitters, which makes a certain amount of sense. Unlike a tube transmitter, which steps the B+ voltage up several times, these transmitters reduce the B- voltage by about 2/3rds or so. With a step up situation, a surge would be multiplied many times and could very easily punch a hole in the transformer’s secondary winding insulation. I have, in fact, experienced this on at least two occasions. That leaves the wiring between the transmitter and the service panel. I double checked the panel breaker with my volt meter to ensure that the voltage was indeed off. Then I removed each phase from the connection lugs in the transmitter and tested the wire to ground with my Fluke 77 DVM. Sure enough, two of the phases showed resistance of 1.2 and 1.7 MΩ to ground were it should have been infinite. Further, when I took the cover off of the service panel, I found a dead mouse. Unfortunately, I didn’t have any #4 THHN and all the home improvement stores were closed by that time, so it had to wait until morning. The thunderstorm seems to be a coincidence. It is a little hard to see, but that shiny spot is copper. The cable jacket is chewed back quite a ways and the entire thing is encrusted in mouse feces and urine. I love to work on stuff like this. LOVE IT! Hantavirus, here we come! That reminds me, I need to get some of those blue latex exam gloves and throw them in the truck… Anyway, far back in the conduit running through the concrete floor where it bends to go up to the service panel, the mice apparently had a nest. 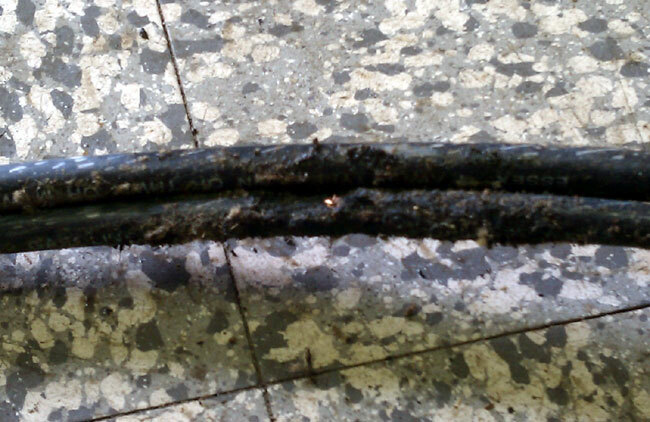 They got into the conduit under the transmitter, where it transitioned from 3 inch rigid to 1 1/4 inch flexible metal without benefit of a junction box or proper fitting. We pulled new copper conductors in and installed a proper junction/transition between the 3 inch and 1 1/4 inch conduit. The service panel was also missing several knockouts of various sizes, which were sealed with knockout seals. The transmitter was back on the air at full power about 16 hours after it went off. Unfortunately, the station has no back up transmitter, so they were off for that period of time. Perhaps now they will look into a backup transmitter or at least an exterminator, but probably not.